This Christmas my daughter saw How The Grinch Stole Christmas! for the first time. We’d read the book to her several times in the months leading up to Christmas, but I knew that however evocatively I read Dr. Seuss’s classic holiday tale to Nora, it would pale in comparison to Boris Karloff’s masterful narration over the animation of the legendary Chuck Jones. When we watched it together at my parents house this week, I’m not sure she was as enamored with it as I was. I came away from the viewing convinced that it was the single greatest adaptation of a children’s book. But as a Christmas story, I wondered if it was yet another work of secularization, a hollowing out of the holy from the holiday, replacing a sacred celebration of Christ’s birth with some vague celebration of holiday spirit (which is really the specter of Christ’s birth). Superficially, The Grinch follows a basic holiday theme: Christmas is not about the stuff we get; it’s about being together with family and loving each other. A Charlie Brown Christmas, which came out the previous year (1965), has the same basic premise as The Grinch but manages to make Christ (rather than general niceness) the antithesis of commercialism and materialism. 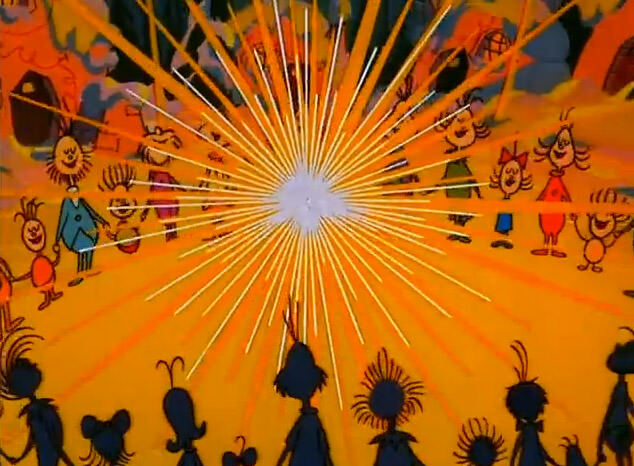 Charlie Brown reacts to the phoniness of Christmas with depression and anxiety, the Grinch with bitterness and spite, but both characters loath the same basic thing: the fake, loud, excessiveness of Christmas. Both characters must reach a sort of Christmas-spirit nadir before they can learn about the “true” meaning of Christmas. The Grinch takes all the excesses away from the Whos and Charlie Brown has all the excesses ruined for him. In the end, Charlie Brown rediscovers the story of Christ’s birth. At the center of Christmas, underneath all our cultural machinations, is the Word became flesh. The Grinch discovers that Christmas doesn’t “come from a store,” instead it means “a little bit more.” But more what, exactly? The book isn’t clear on this point. The Grinch hears the Whos singing and is moved by their joy and festiveness in the absence of presents. But why are they joyful and festive? The 1966 TV short offers us some clues. The lyrics of the catchy “Fah Who For-aze,” lyrics written by Seuss, suggest that the real spirit of Christmas is our togetherness. It comes when we are “heart to heart, and hand in hand.” That sounds pleasant enough, but if it appears (as it does!) in the place of Christ’s birth and His redemption of the world, what role should such a program have in my family’s holiday traditions? I wondered if How the Grinch Stole Christmas! might be yet another example of the secularization that took place in much of 20th Century American culture, a phenomenon where cultural works would co-opt the language and style of a religious worldview, but without the actual substance. In the show, we have all the moral and formal trappings of a spiritual holiday — one which resonates with transcendent significance (remember the ball of glowing light which rises from the circle of singing Whos at the end?) — without the actual, transcendent source. But here’s the flipside to this kind of co-opting of religious forms: sometimes the results, while not ideal, are absolutely beautiful. I think that’s the case with The Grinch. Aesthetically, the show is a masterpiece. The use of color, tone, language, rhyme, music–virtually every quality of the show is lovely and skillfully done. If we stopped there, we could say that by Common Grace the TV show is beautiful, even if it fails to convey the significance of Christ’s incarnation. But we shouldn’t stop there. For a variety of reasons, our culture in the United States has increasingly shed its shared traditions in the last hundred years. Christmas is unique because so much of the entire country is transformed. Houses are decorated. The night changes color. Stores change. The stories we tell change. But for the most part, the traditions that we share are very thin. Christmas lights, a tree, presents, shopping, Black Friday, visiting family–these are not rich traditions. Their meaning varies dramatically from family to family, with perhaps the only common significance of Christmas being that it’s Christmas. It’s a self-referential tradition, and that is what is so strange about The Grinch. It reflects a culture largely united by a tradition. It may be only a celebration of community, but at least it is a shared tradition, one that shapes the community and the individuals in it. How the Grinch Stole Christmas! is not the story of how a person came to love a holiday. It’s the story of how a self-imposed outsider came to love a community through a holiday tradition. No, this message does not convey the Incarnation as Linus’s famous monologue does in A Charlie Brown Christmas, but it does remind us that we are carnate, that we live in communities, that we belong in history as a part of larger traditions. In its own way, in its alternate Whoverse where Christ does not seem to exist but His holiday does, The Grinch may reawaken in us a sense of tradition which is framed by the Church and our local communities. Alan Noble, Ph.D., (Co-Founder and Editor-in-Chief) is an Assistant Professor of English at Oklahoma Baptist University. He received his Ph.D. from Baylor in 2013. He and his family attend Shawnee Pres in Shawnee, OK. He is also author of the book, Disruptive Witness.